We have but two more leagues to review in our jaunt through the college football landscape. We begin the end of our SDPI reviews with a look at the MAC, a league even the NFL envies with its commitment to parity. More on this later. If you want a primer on what's going on here, follow the link to last year's MAC post. As usual, this first paragraph will explain how SDPI is calculated. So if you want the meat of this article skip on down. In the 2010 MAC regular season, conference play only, championship game excluded, the average MAC team gained and allowed 2807.23 yards. The standard deviation for yards gained (offense) was 528.97 yards. The standard deviation for yards allowed (defense) was 403.62 yards. Kent State gained 2517 yards and allowed 2418 yards. Their offensive SDPI was -0.55 = [(2517-2807.23)/528.97]. Their defensive SDPI was 0.96 = [(2807.23-2418)/403.62]. Their total SDPI was 0.42. This number ranked 7th in the MAC. Here are the 2010 MAC standings. Now here are the 2010 MAC SDPI standings. The standings are sorted by division by total SDPI with ranking for each category (out of 13 teams) in parentheses. The MAC almost had a team finish the year ranked for the second consecutive season. Heading into the MAC Championship Game, Northern Illinois was ranked 24th in the AP Poll. However, their upset loss to Miami dropped them out of the poll. Still, the MAC enjoyed a solid season, with its top two teams (Miami and Northern Illinois) winning bowl games in relatively easy fashion. Northern Illinois' win over Fresno was especially satisfying as the Bulldogs (deservedly or not) are one of the more revered mid-major teams. Pick your directional Michigan school. Both Central Michigan (won three of the previous four MAC titles) and Western Michigan were much better than their records showed. Central Michigan was undone by turnovers (committed a league-high 25 in MAC play for league-worse margin of -13) and an inability to win close games. Their 1-5 record in one-score games (1-3 in the MAC) relegated them to their first losing season since 2004. 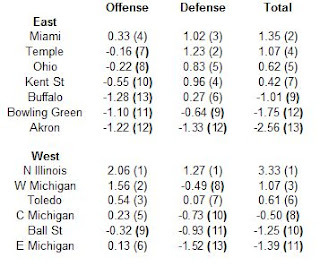 Meanwhile, Western Michigan rated out as the third best team in the league statistically. They too struggled in close games (0-2 overall and in the league), but won several blowouts (four of their five league wins came by at least 29 points), suggesting that they were capable of much more than a third place finish in the division. The Toledo Rockets enjoyed their first winning season since 2005, but a great deal of their success is likely unsustainable, unless they improve their overall play. Toledo forced a league-high 27 turnovers in MAC play and turned the ball over just nine times for an absurd margin of +18 in eight games (for comparison's sake, they forced 10 and lost 23 in 2009). That number will likely trend the other way in 2011. Make no mistake, the Rockets were in the upper-half of the MAC statistically last year. However, their play was not indicative of a team that lost just a single conference game. The Huskies never failed to generate at least 420 yards of offense or 28 points in any league game until they were held to 373 and 21 respectively in their MAC Championship Game defeat. New coach. New quarterback. Yuck. After rolling for 441 yards against Bowling Green in their conference opener, the Bulls averaged just 241 yards per game over their last seven. For the season, their leading rusher gained just 298 yards and averaged under 3 yards per carry. Western Michigan was the only MAC team to top 400 yards against the Huskies, until Miami put 432 on them in the MAC Championship Game. The Eagles somehow held Ball State and Buffalo in check (540 combined yards), but were utterly hopeless against everyone else (allowed 480 yards per game). I know what you're thinking: How can the MAC, one of, if not the weakest of the IA conferences possibly be compared to the best of the best in the National Football league? The answer is simple - parity. The NFL prides itself on the notion that even woebegone teams and franchises are just a year or two away from contention. The MAC may not tout its parity like the NFL, but rest assured it does exist. Before we delve into the hard numbers, consider these few facts. Over the past three seasons, Buffalo has won the MAC, and finished 1-7 in the conference just two years later. 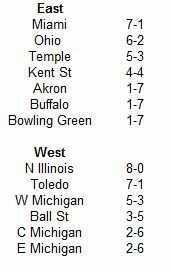 Ball State and Central Michigan have both finished unbeaten in MAC play, then 2-6 the very next year. Bowling Green has finished with six league wins one season and then two the next. Miami went from the basement of the East division (1-7) to the top of the East (7-1) in just one season. I could go on, but suffice it to say parity is alive and well in the MAC. How much parity is there in the MAC and how does this parity compare to the other ten IA conferences? To answer that question I did a simple regression analysis to determine how well a team's conference wins in one season predict their conference wins in the following season. I looked at three years worth of data (2008-2010). That is, how well did a team's 2008 conference record predict their 2009 conference record and how well did their 2009 conference record predict their 2010 conference record. The R squared values for each conference are included in the chart below. The R squared value tells us how much of the variation in the dependent variable (conference record) is explained by the independent variable (last year's conference record). As you can see, the MAC has been by far the least predictable conference, at least when using last year's standings as a baseline. Barely more than 3% of the variation in conference record can be explained by last season's conference record. On the other end of the spectrum, the Pac-10, WAC, and Mountain West have been much more consistent in terms of their final standings. So what does this mean for 2011? Bet the house on Eastern Michigan winning the MAC. Last week we looked at the WAC, one of the mid-major leagues that will be undergoing significant changes over the next two seasons. Now we will take a look at the Mountain West, another conference experiencing a makeover this season and in 2012. For some background on whats going on, here's the link to last year's Mountain West post. As usual, this first paragraph will explain how SDPI is calculated. So if you want the meat of this article skip on down. In the 2010 Mountain West regular season, conference play only, the average Mountain West team gained and allowed 2946.44 yards. The standard deviation for yards gained (offense) was 617.70 yards. The standard deviation for yards allowed (defense) was 667.42 yards. Air Force gained 3399 yards and allowed 2906 yards. Their offensive SDPI was 0.73 = [(3399-2946.44)/617.70]. Their defensive SDPI was 0.06 = [(2946.44-2906)/667.42]. Their total SDPI was 0.79. This number ranked 3rd in the Mountain West. Here are the 2010 Mountain West standings. 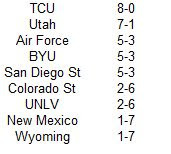 Now here are the 2010 Mountain West SDPI standings. The standings are sorted by total SDPI with ranking for each category (out of 9 teams) in parentheses. In late October the Mountain West actually had two teams ranked in the top-10 of the AP poll. The Utah Utes lost two games down the stretch, then lost to Boise State in their bowl game to fall out of the top-25 altogether. Still, the Mountain West enjoyed a solid season, with a 4-1 bowl record, including two bowl wins over BCS conference teams (Wisconsin and Georgia Tech), had their league champion finish ranked number two in the country for the second time in three seasons, and saw one of their coaches leave for one of the premiere jobs in the nation (Michigan). With Boise State joining the fold in 2011 followed by Fresno State, Hawaii, and Nevada in 2012, the Mountain West is poised to remain one of the preeminent mid-major leagues despite the losses of BYU, Utah, and TCU. BYU began the season 1-4, with non-competitive losses to Air Force, Florida State, Nevada, and Utah State. After upsetting San Diego State, TCU blew the Cougars out in Fort Worth. BYU proceeded to win four of their final five regular season games, with the lone loss coming by a single point at arch-rival Utah. Statistically, BYU was the second best team in the Mountain West, but thanks to that close call against Utah (lost when their game-winning field goal attempt was blocked), they had to settle for a tie for third in the Mountain West standings. In their final season of play in the Mountain West, Utah looked like they may leave for the Pac-10 with a conference title in tow. However, despite their sterling 7-1 league mark, Utah was actually several notches below league champ TCU, and very fortunate to finish with just one league loss. Within the conference, Utah was 3-0 in one-score games, beating the other bowl-eligible teams (Air Force, BYU, and San Diego State) by a combined 10 points. The Utes did not acquit themselves well in their high-profile contests, scoring just 13 points in games against TCU, Notre Dame, and Boise State (lost by a combined 88 points). The Horned Frogs gained at least 500 yards in five of their eight league games, and were held below 400 yards just once (against BYU). Year Two of the Mike Locksley era was not much of an improvement over Year 1. The Lobos topped 400 yards just once during Mountain West play, in their lone win versus Wyoming. At least Mr Locksley didn't punch any assistants or have busy hands with his secretary. The Horned Frogs amazingly held six of their eight league opponents to fewer than 200 yards of total offense. The Lobos pulled double duty at the bottom of the Mountain West. Their defense held only one league foe (San Diego State) below 400 yards. There's a reason Boise State, Fresno State, Hawaii, and Nevada did not hesitate to say 'Yes' when the Mountain West offered them membership. While they may not all be able to use the Mountain West as a stepping stone like Utah and TCU, and gain entry into one of the BCS conferences, the league does provide a stiffer challenge and better prestige than the WAC. 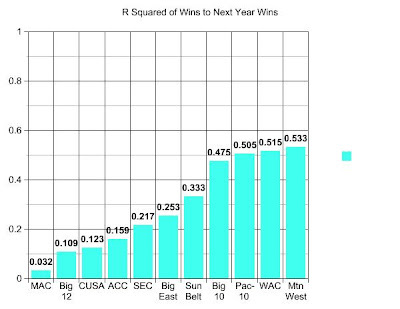 The Mountain West has been by far the preeminent non-BCS (mid-major conference) over the last half-decade. Don't believe me? I have graphs! 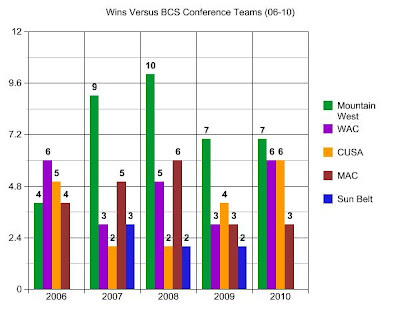 This first graph simply lists the number of victories each mid-major conference (Mountain West, WAC, CUSA, MAC, and Sun Belt) have over BCS conference foes (and Notre Dame) since 2006. With the exception of 2006, the Mountain West has boasted more victories over BCS conference foes than any other mid-major conference. 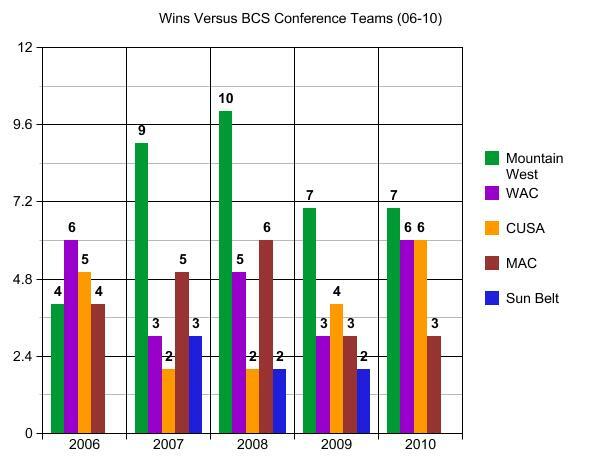 Over the past five seasons, Mountain West teams have won 37 games against BCS conference opponents. The WAC is second in that span with 23 such victories. And don't think that the wins have been limited to the Big 3 (BYU, TCU, and Utah). Middling teams like Wyoming (wins over Tennessee and Virginia), UNLV (Arizona State and Iowa State), and New Mexico (Arizona twice) have also contributed some scalps. 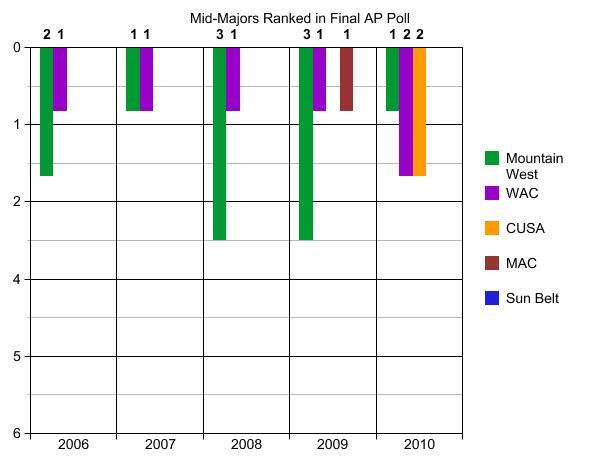 The Mountain West has also been the mid-major conference with the most teams ranked in the final AP poll. The Mountain West has had 10 teams finish the season ranked in the top 25 since 2006 (an average of two per season). The WAC is next with six. In this case, your initial hunch is correct. the Big 3 have accounted for each top-25 appearance. Alas, the Sun Belt has yet to have a team finish the season ranked in the top 25. This week, our conference recap takes us to the WAC, a league that may soon cease to exist in football. Boise State will be joining the more prestigious Mountain West in 2011, with Fresno State, Hawaii, and Nevada following suit in 2012. Oh well, for at least one more season, the WAC is alive and well. For a primer on what this series is about, here's the link to last year's WAC post. As usual, this first paragraph will explain how SDPI is calculated. So if you want the meat of this article skip on down. In the 2010 WAC regular season, conference play only, the average WAC team gained and allowed 3288.67 yards. The standard deviation for yards gained (offense) was 725.55 yards. The standard deviation for yards allowed (defense) was 636.94 yards. Fresno State gained 2917 yards and allowed 2839 yards. Their offensive SDPI was -0.51 = [(2917-3288.67)/725.55]. Their defensive SDPI was 0.71 = [(3288.67-2839)/636.94]. Their total SDPI was 0.19. This number ranked 4th in the WAC. Here are the 2010 WAC standings. 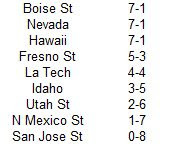 Now here are the 2010 WAC SDPI standings. The standings are sorted by total SDPI with ranking for each category (out of 9 teams) in parentheses. The actual standings and SDPI ratings agree there was a triumvirate at the top of the WAC in 2010. Boise continued their dominance in their swan song, but Hawaii and Nevada also rose up and enjoyed solid seasons. The WAC nearly placed two teams in the top-10 of the final AP poll for the first time in its history with Boise finishing the season ranked 9th and Nevada 11th. When the Wolfpack upset the Broncos in exciting fashion on November 26th, it marked the end of Boise's 22-game WAC winning streak and 35-game regular season winning streak. On the other end of the spectrum, San Jose State failed to win a league game, and dating back to their slide to end the 2008 season, the Spartans are now 1-18 in their last 19 conference games. The WAC standings line up nearly identically with the SDPI ratings. However, Boise is probably the team that is most underrated by their standing in the conference. While the Broncos tied for the league title, they thoroughly dominated their league opponents, with the exception of a second-half meltdown in Reno. The Broncos won each of their other league games by at least 29 points, and eviscerated fellow co-champ Hawaii by 35 points. For comparison's sake, the Broncos posted a combined SDPI of 2.44 in 2009. The second rated team, Nevada, posted a combined of SDPI of 2.13 for an advantage of 0.31 standard deviations. 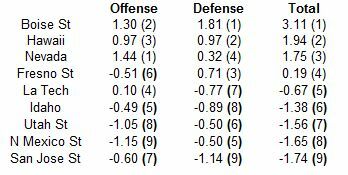 If you don't want to go back and look at the table, Boise posted a combined SDPI of 3.11 last year. Hawaii was second at 1.94, 1.17 standard deviations below Boise. Misfortune in the kicking game was the only thing keeping this team from a third consecutive perfect conference mark. Once again, we're splitting hairs here as the WAC teams that were good in 2010 posted good records and vice-versa. However, Idaho managed to win three league games despite not being appreciably better than the three teams that finished below them in the standings. Idaho followed up their surprising 8-5 2009 season with a somewhat disappointing 6-7 mark. However, outside of 2009, the six wins represent their most in a season since 1999 when they went 7-4. The Vandals were not particularly lucky in 2010, they just weren't a great deal better than Utah State, New Mexico State, or San Jose State, which combined won as many games in conference as Idaho. The Pistol was a 357 in 2010. The Wolfpack continued their dominance (finished first in the category in 2009) with Colin Kaepernick under center (or just behind center as it were) in his senior season. Outside of their struggle on the islands (season-low 293 yards), the Wolfpack averaged 577 yards in their other seven conference games. The Aggies topped 400 yards of offense just once on the year, in their lone league win versus San Jose State. They were held below 215 yards three times in league play. Nevada showed they were mortal when they racked up 528 yards in their upset win. However, in their other seven league games, the Broncos were nearly impenetrable, allowing just 230 yards per game. What's an easy way to go winless? Allow over 500 yards per game to your conference brethren. The Spartans were at their worst against Nevada and Hawaii, allowing them to gouge them for over 1200 yards in the two games. Even casual fans by now know about Boise State. The Broncos, along with schools like TCU and Utah, have been the poster child for mid-major football the past few seasons. The Broncos routinely dominate their opponents in the WAC and also hold their own against the big boys from the BCS leagues. To satisfy my own curiosity, I wanted to find out how dominant Boise State was in regards to protecting their own quarterback and pressuring the opposing quarterback in the confines of WAC play. To answer that question, I wanted to look at more than just total sacks and sacks allowed (though Boise did lead the WAC in both categories with 30 sacks and just 6 sacks allowed). Instead I looked at sack rate. Sack rate is simply the number of sacks divided by the number of pass attempts plus sacks. This number tells us how many times out of 100 pass attempts a team sacked the opposing quarterback or was sacked by the opposing team. 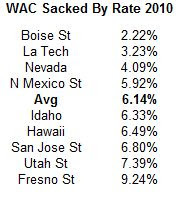 The table below lists the sacks rates (higher is better) for WAC teams in 2010 (conference play only). The average sack rate was 6.14%. Boise State sacked opposing WAC quarterbacks at a rate of more than once every ten pass attempts, while Utah State registered a sack roughly every 40 pass attempts. 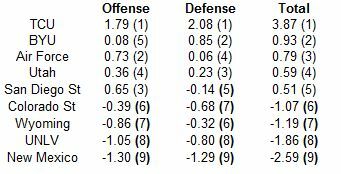 Just eyeballing sack rates, the ability to sack opposing quarterbacks seems to align itself pretty evenly with overall defensive ability. Most teams were ranked in sack rate very close to where they were ranked in defensive SDPI. 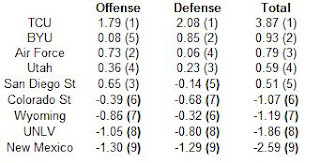 The big exception is of course San Jose State, which finished dead last in the conference in defense, but was actually about average in sack rate. Unfortunately for the Spartans, when they didn't sack the opposing quarterback, their secondary broke down. 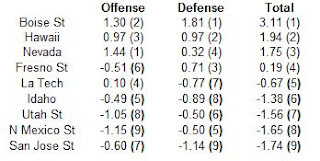 WAC opponents averaged more than 8.5 yards per pass attempt. Now let's look at how often a team's quarterback was sacked by the opposition (lower is better). Once again Boise State is by far the cream of the crop. Opponents sacked Boise quarterback Kellen Moore just once every 45 drop backs. On the other end of the spectrum, Fresno State quarterback Ryan Colburn was sacked about once every 11 pass attempts. 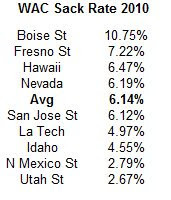 This helps explain why Fresno finished with a below average SDPI rating (6th in the WAC) despite Colburn's otherwise solid passing stats.